The saxophone is classified as a woodwind because it is played using a reed. But it's made of brass. It's a kind of a cross between a woodwind and a brass instrument. The saxophone has a single reed and a mouthpiece like a clarinet, but it has a metal body with a flared bell. 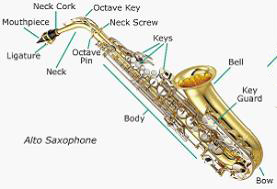 There are five major types of saxophones, each playing a different range of notes: soprano, alto, tenor, baritone, and bass. Saxophones make a strong, mellow sound. The saxophone was invented around 1840 by a Belgian instrument maker named Adolph Sax. The saxophone was originally supposed to be used in military bands. In 1844, saxophones first appeared in symphonic orchestras. However, pieces were only occasionally written to include saxophones. It wasn't until the 20th century in America when saxophones became popular because of their association with the development of jazz. Today, it is used mainly in jazz, rock, blues, and pop. You'll hear it a lot in music on television and movies, too. Orchestras sometimes need a saxophone to play solo parts. Today, the saxophone is most often associated with jazz, even though every now and then you'll find one in an orchestra. Jazz players often switch among the different ranges of saxophone, from a soprano - which is shaped like a clarinet - all the way down to a big baritone sax. Here's a picture of an alto saxophone so you can see all the major parts. The saxophone has a clarinet-like mouthpiece which fits onto the top of the instrument. The ligature secures the reed in position. The saxophone has keys that extend over much of its length. Each key covers a tone hole. The saxophone is supported using a combination of a thumb rest and a neck strap. The bell of the saxophone flares out. The bells of alto, tenor, and baritone saxophones are turned upward and lean slightly forward to help project the sound. Soprano saxophones have a bell that faces straight down, like a clarinet.